Clockwise from upper left: pure vanilla extract (the recipe calls for one teaspoon); 170 g of chopped Valrhona Guanaja 70% bittersweet chocolate (“for baking”, but it eats pretty nice too); six room-temperature large eggs, separated; ¼ tsp cream of tartar; 150 g sugar; 1 tsp espresso powder; and 10 g of Valrhona cocoa powder. 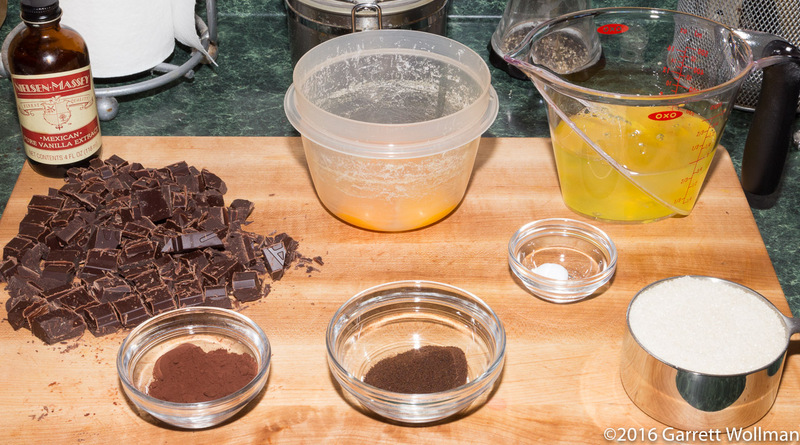 The first step is to dissolve the espresso powder in ⅓ cup (80 ml) of hot water. 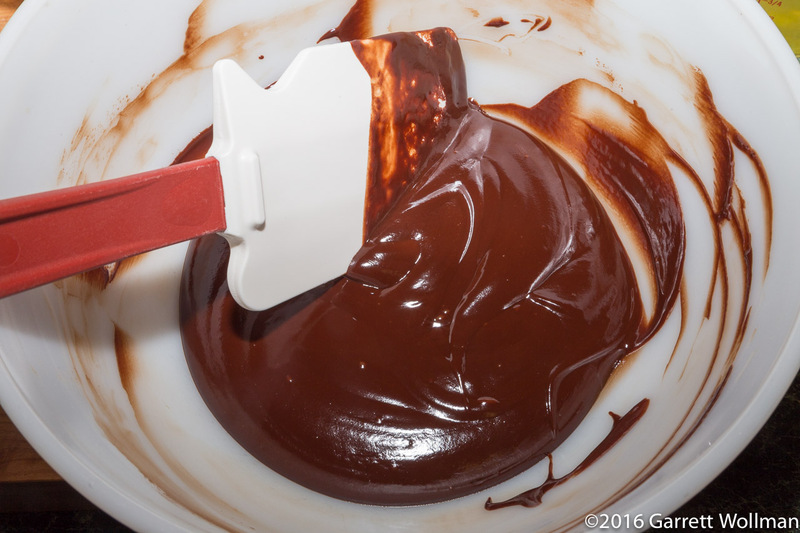 The result is mixed with the chopped chocolate and melted in the microwave, and the teaspoon of vanilla is stirred in after the chocolate mixture is melted and smooth. This is then set aside to cool, so that the egg yolks can later be incorporated without scrambling. 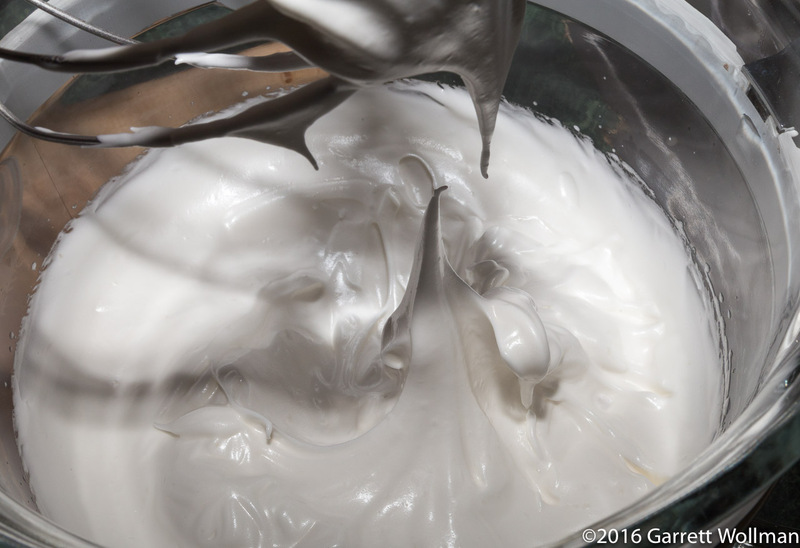 While the chocolate is cooling, a meringue is made by whipping the egg whites and cream of tartar, then gradually adding the sugar while continuing to whip until stiff (“but not dry”, Medrich always says) peaks are formed. The cake is baked in a parchment-lined half-sheet pan. Because my parchment comes on a roll, it tends to curl up if I don’t do something to stick it to the pan, which would make the process of spreading out the cake batter quite difficult, so I use a few pulses of baking spray on the underside of the parchment. 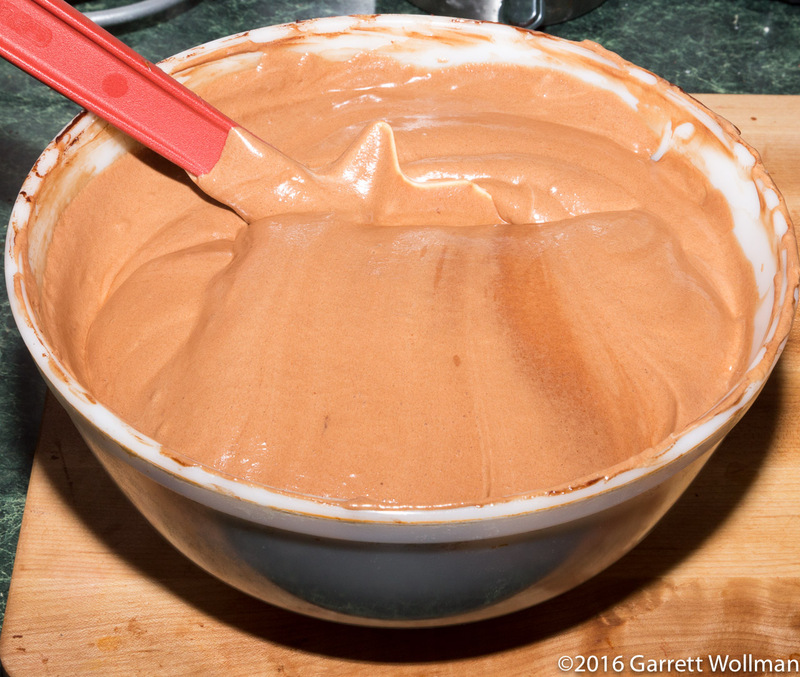 The cake batter doesn’t have to be perfect, because most of the imperfections will be hidden when the cake is rolled up. However, it is important that it be fairly even, so that it cooks at the same rate. It’s hard to tell the difference between this photo and the previous one, but now the cake is cooked. It takes a short time, only about eight minutes at 375°F (190°C), but then must cool completely in the pan, about another half an hour or so. It turns out that I have very few serving platters of an appropriate length to present a “Bittersweet Roulade”, so I was stuck with this winter-themed one. After removing the foil, I trimmed the edges and sifted some powdered sugar over the top. Unfortunately, after a couple of hours, the powdered sugar had all dissolved, so my work tasters didn’t get the full effect. You can see in this end-on view how the chocolate ganache filling and the chocolate cake are pretty much indistinguishable after several hours in the fridge. Everyone raved about the chocolate flavor as it was, but I would have preferred to have sufficient contrast to make it obvious that there actually was a filling. Nobody complained about coffee flavor, despite the fairly large quantity of espresso powder, myself included. 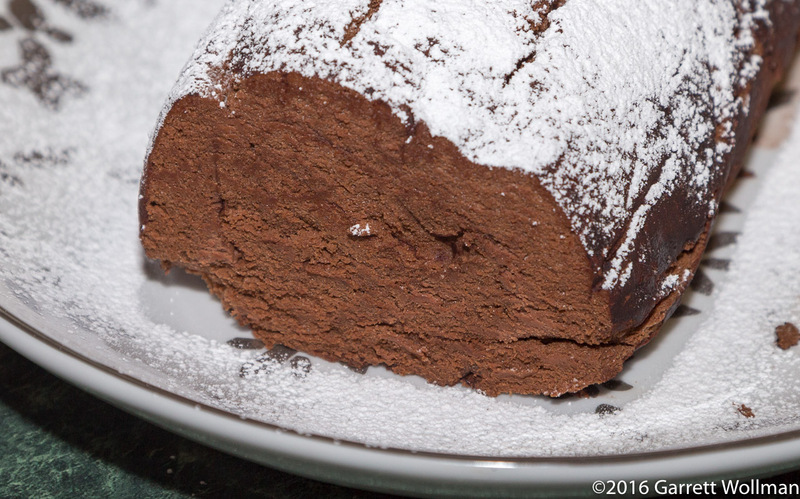 Gallery | This entry was posted in Food and tagged Alice Medrich, cake, chocolate, recipe. Bookmark the permalink. 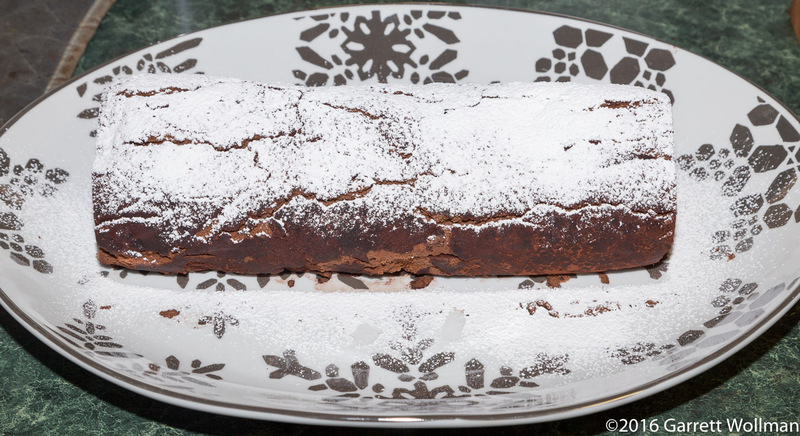 I made this for a Yule Log cake last Christmas, and used her recipe for white chocolate ganache (added peppermint extract). It turned out perfectly, with a nice contrasting swirl!